Chachapoyas is a city in northern Peru. It is the capital of the Amazonas Region and the Chachapoyas Province. At an elevation of 2234 meters (7,657 feet). The city has a population of approximately 17,000 people. Situated in the mountains far from the Peruvian coast, Chachapoyas remains fairly isolated from other regions of Peru. There is daily service by bus to Chiclayo and Cajamarca. Although there is a local airport, flight service is limited. Local industries include agriculture, sugar cane, orchid and coffee growing. The city’s name is derived from the people living in this region of Peru at the time of the Spanish conquest. 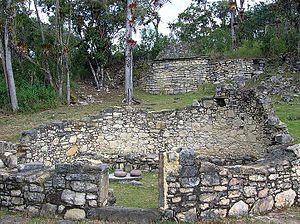 The original occupants of the area, the Chachapoyas culture, are thought to have been a group of allied settlements or tribes in the region of the present-day city. The name Chachapoyas may be derived from an Aymara word "sachapuyos", meaning "the cloud people", but there is no official consensus as to the origin of the name. 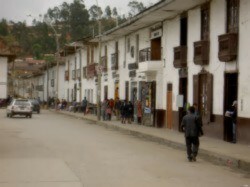 The modern city of Chachapoyas was founded in 1538 C.E. by the Spanish captain Alonso de Alvarado. Named San Juan de la Frontera de Chachapoyas, the city was first established near La Jalca, and then near Levanto. The city's original locations were abandoned due to climate, disease and a lack of defenses against rebelling local groups. The Spanish colonials moved the city to its present location several years later, in 1545 C.E. Spanish influence is still evident in the architecture and layout of the town. Many houses are constructed of traditional colonial architecture, with balconies and central courtyards. In the Plaza de Armas stands a bronze fountain honoring Toribio Rodriguez de Mendoza.